Titan, Saturn’s largest moon, hovers in front of the planet’s rings like a holiday ornament in this natural color photo snapped by the Cassini spacecraft and released on December 22. The hazy orange moon looms large next to bright, icy Dione – Saturn’s third-largest satellite – against the shadows of Saturn’s rings. Titan looks murky because of its atmosphere – a puffy, blue-rimmed nitrogen shroud. The cloudy cover is darker at the moon’s north pole and slightly flattened at the moon’s south pole (see this Casssini image also released December 22). 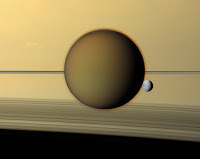 Organic compounds within the smoggy layer form clouds of ethane and methane that seasonally rain down upon Titan’s surface. Dione – essentially a spherical ice cube with a rocky core — is heavily cratered, cut with canyons, and home to icy cliffs. In this image, Dione is 3.2 million kilometers away from Cassini; Titan is 2.3 million kilometers away.